The following post was originally featured on April 29, 2014. When I first heard Alvin Dixon’s voice I was driving along Dupont Avenue in Toronto with my partner, Laural, and our three-month-old son, Oscar. Dixon was talking to Rick MacInnes-Rae, who was filling in as the co-host of the CBC Radio show As It Happens. The interview was about Dixon’s experience at the Alberni Indian residential school (AIRS) where he had unwittingly been part of a recently uncovered nutrition experiment conducted by the federal government during the late 1940s and early 1950s. 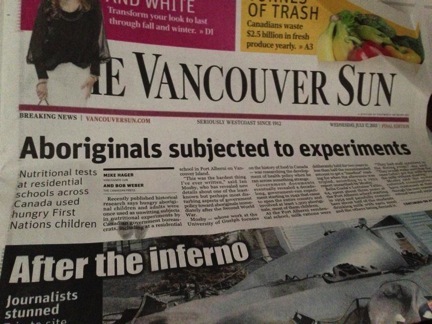 By the end of the interview I was in tears – something that would happen with increasing frequency over the coming months as I met, corresponded with, and listened to the stories of survivors of these experiments and of Canada’s Indian residential school system more generally. While I’m still not sure what I expected to happen after I published my research on these experiments, I don’t think anything could have prepared me for how profoundly the strength, courage, and anger of survivors like Dixon would change my life and my perspective on what it meant to be an (active) historian.